George H. Spelius, President of the Midwest League, announced the league's 2013 All-Star Game rosters Wednesday. The All-Stars were nominated and selected by the circuit's field managers. The Dayton Dragons are hosting the 2013 MWL Summer All-Star Classic on June 18th at Fifth Third Field. The Western Division will be looking for revenge after suffering an 18-2 defeat in last year's showdown in Kane County. Bowling Green (Rays) led the way with nine selections, the most in team history. The Hot Rods will contribute three starters, two reserves and four pitchers to the Eastern squad. Bowling Green's staff ranks second in the league with a 3.31 ERA. In the Western Division, first-place Cedar Rapids (Twins) has eight All-Stars, including 19-year-old Byron Buxton, the second overall pick in the 2012 Draft. Buxton leads the league in on-base percentage (.435), ranks second in batting (.333) and slugging (.545), and is fourth on the circuit with 26 stolen bases. The only player picked in front of Buxton last June, Astros prospect Carlos Correa of Quad Cities, also makes the Western squad as the starting shortstop. Beloit and Kane County feature six All-Stars apiece in the West, including Cougars designated hitter Rock Shoulders, who has hit a league-leading 12 home runs. Fort Wayne and host Dayton have five players each on the Eastern roster. Dragons starter Robert Stephenson is among them after notching a league-best 77 strikeouts thus far. 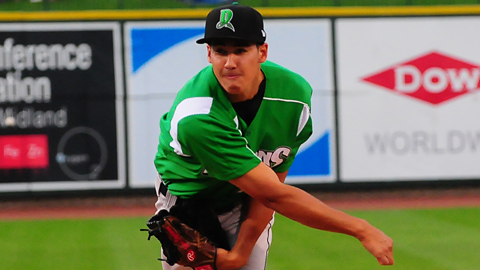 ^ Steven Gruver replaced Cedar Rapids right-hander Tyler Duffey on June 6 after Duffey's promotion to Fort Myers. ^^ On June 10, the following changes were announced for the Eastern All-Stars: South Bend's Daniel Watts replaced Great Lakes' Jharel Cotton, who was promoted to Chattanooga; Great Lakes' Tyler Ogle replaced Fort Wayne's Jeremy Baltz as the starting designated hitter, as Baltz is injured. South Bend's Alex Glenn replaces Baltz on the roster. On the Western Division roster, Wisconsin's Austin Blaski replaces Peoria's Tyrell Jenkins due to Jenkins' injury.